I manage a small business of 15 employees, and when I started reading about employee time theft, my first reaction was to assure myself that it wasn’t happening here. “Not my employees,” I said to myself. I trust them. They’re really good people. I had no reason to believe that one of the biggest factors in our struggle to grow the company was our own employees cheating on their time cards. As it turns out, it can be a pretty big problem, and it happens both intentionally, and unknowingly. When the issue of time theft first came to my attention, I was at a conference dedicated to serving the time and attendance needs of small businesses like mine. For the most part, attendees were HR managers or accountants for brick-and-mortar retail stores in shopping plazas and malls across the United States. Presenters came from a wide range of time and attendance solution providers including software and SaaS providers, as well as hardware manufacturers who sell things like biometric time clocks, mobile clocks, and other timekeeping related electronics. There were a lot of people from what they call the “hospitality” industry, which includes hotel and resort managers, and a surprising number of event planners and travel and vacation organizers. There were also strong contingents representing national restaurant chains and local mom-and-pop food services. An eclectic mix with one thing in common; we all have a large percentage of employees we pay by the hour. The issue of “buddy punching” came up in a session I attended. I whispered to my companion that “we used to do that in high school.” He wasn’t amused. As it turns out, it’s no joking matter; according to research by the American Payroll Association, buddy punching is affecting about 75% of our nation’s small businesses. And though I couldn’t believe it at the time, a survey of actual employees found that, on average, companies are losing about 4.5 hours per week, per employee. I reached for my phone and tapped on the calculator to run a rough estimate of what this could mean for my business. I have 15 employees, total. Eleven of them are hourly. I took a conservative route and assumed that 75 percent of my employees could be buddy punching, and did the math. This gave me a number of 8.25. To keep things simple, and to err on the side of conservative estimates, I rounded down to 8 for my next calculation. Next, I multiplied the number of employees (8) by the average number of hours reported stolen per week in the report cited in my conference session: 4.5 hours. Thirty-six. Let that sink in for a minute. I did, and the more it sunk in, the more I wanted to jump out of my seat and run back to the office to figure out how to make it stop. According to market research, my company is losing 36 hours per week to buddy punching, alone. My initial thought was that this amounted to an entirely new employee joining our company—something we have not been able to justify because of our budget constraints. According to my phone, which I double-checked, I had already hired this person and didn’t even know it. As I sat there pondering the long-term benefits of hiring a new employee, or saving 36 hours per week, the presenter shifted to the topic of early punch-in, and late punch-out. An early clock in is something we have considered, and late clocking is always a concern, but I had no idea how much this was already affecting my business. With only 11 employees on our time system, the numbers started adding up pretty quickly. I looked around the room and wondered how many of my new hotel friends or restaurant owners would multiply my calculations by tens, or even hundreds. I watched as smartphones around the room began reporting numbers that, by the looks on many faces, were not in harmony with our small business scheduling budgets. In the hospitality industry, for example, a single mid-sized hotel can easily employ over 50 employees working hourly to perform tasks such as housekeeping, laundry, room service, and security. If each employee at a hotel clocks in just five minutes early each day, that can result in a budget overreach of four hours per week, or roughly 208 hours per year. If those employees are earning $8 per hour, that means about $1,664 in unaccounted time per year. Not A Lot, But it all adds up. The conversation quickly turned to the number of clock-ins, and clock-outs that can occur during the day. Employees are arriving to work, taking a morning break, leaving for lunch, clocking in and out for an afternoon break, and leaving at the end of the day. That’s a lot of ins and outs. Suddenly a few minutes here-and-there turned into vast amounts of unaccounted time being leaked away like the buckets of water quietly draining away through that leaky faucet I still haven’t fixed in my guest bathroom. I considered the comparison for a second; every time I walk past the guest bathroom, I am reminded that I have a small leak in the faucet, but because it is only a small, silent drip, I often think “I’ll get to that on the weekend,” but never do. The faucet has been leaking now for the better part of a year, and I am suddenly aware that I am losing a lot of water without even realizing it. Clock in to start their day. Clock in after morning break. Clock in after afternoon break. This means there is a potential for each employee to clock in or out by 5 extra minutes, eight times each day, resulting in a potential advantage of 40 minutes each day. If they stretch that to 10 minutes, it can be 80 minutes of unplanned overtime, for a total of nearly 1.5 hours each day. Granted, most workers aren’t going to take advantage of both ends of a break, potentially reducing their break time to only a few minutes. However, savvy employees will absolutely take advantage of the opportunity to get a few extra minutes. The impact can be more than just unplanned overtime; there are also overtime implications for time-and-a-half calculations, as well as FLSA, ACA, and other regulatory restrictions that could have you paying even more, or possibly losing floor time at the expense of running over budget. (11 employees x (8 punch in/out opportunities of 5 minutes)) / 60 minutes = 7.3 hours each day. 7.3 hours each day works out to 36.5 hours each week or the rough equivalent of (another) full-time employee. If you’re keeping track, that’s two full-time employees I could have hired if I had a better way to manage time theft, buddy punching, and early and late punch ins and punch outs. And those are conservative estimates for my small team of eight. If you are a company with 10, 20, or 50 employees, we’re talking significant unplanned overtime. The American Payroll Associate estimates this could account for as much as 30 percent of your bottom line. Money walking out the door means you’ll continue your struggle, as we have. Talk about an eye-opener. Over the course of the ensuing question and answer period, several including myself steered our inquiries to how other small businesses are solving the problem of employee time theft and early or late clock-ins and buddy punching. I was always under the impression that biometrics were for the big guys, and have associated the thumbprint reading technology with big offices, big budgets, and big brother. To my pleasant surprise, a few vendors in the audience had plenty of answers to dispel our collective concern about budgets and implementation. When it comes to solving the problems of things like buddy punching and skimming a few minutes here and there, biometric time clocks have a lot of answers that make solving these problems nearly as easy as plugging in a toaster. There are several varieties of biometric clocks. Most require an employee to confirm their identity with a fingerprint or handprint. Some of the more futuristic versions perform a quick iris scan, and the leading-edge tech is doing full facial recognition, very similar to what Apple’s popular iPhone X can do. Full facial recognition is a little farther out for our small business budgets, but it’s certainly on the way. Fingerprint technology is in wide usage, is easy to install and set up, and solves a lot of our problems without the high-tech intimidation I originally associated with such a James Bondian device. Another great advantage is that several companies providing the biometric clock in solutions have designed their products to integrate with popular time and attendance solutions offered by leading providers such as SwipeClock. We’re combining SwipeClock’s Workforce Management Suite with a biometric time and attendance clock in order to make buddy punching a realistic impossibility. Employees will be required to confirm their identity with their own fingerprint, and won’t be able to punch in for a late buddy. This single solution alone promises to save our company the cost of one whole full-time employee. We’ll make up the cost of purchasing and installing the new hardware in less than two months, and employees will now be personally accountable for their time. Happily, this will eliminate the ethical dilemma of how to respond when your buddy asks you to punch in for them; it literally can’t happen, so our employees are happy it won’t even come up. Early and late punch-ins are also reduced to our own tolerances based on the software we have selected. 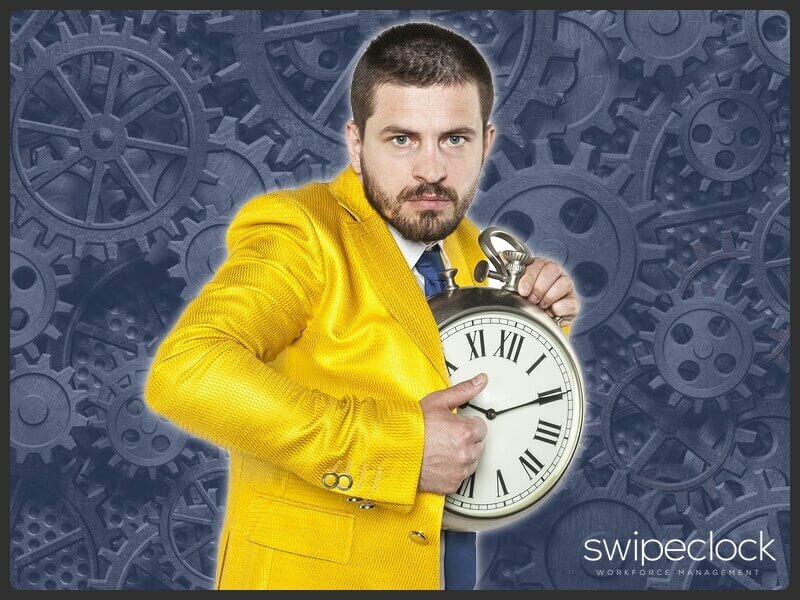 SwipeClock allows us to set parameters on how early, or late, an employee can punch in. Since we have eliminated buddy punching, employees are now responsible for regulating their own time in and out and are not allowed by the system to punch in any earlier than their prescribed start time. Likewise, late punch outs are flagged, warnings are provided, and we feel like we have a better handle on unplanned overtime. We’ve even discovered that implementing biometric time clocks will help with missed punches. Because we are tracking specific individual employees with biometrics, our SwipeClock system can filter punch in and punch out options based on conditional logic. For instance, if an employee has punched out for a break, the system knows their only option is to punch in from the break. This helps reduce punching errors and helps assure our employees that they are getting their time recorded correctly. Occasionally we have employees working at remote locations. Retail stores and restaurants don’t have this problem as much as construction companies, hotels, and other location-based hospitality businesses such as event management and planning. It’s particularly nice to have mobile biometric time and attendance solutions that can help us manage employees remotely without having to question time and attendance records. Biometric time clocking certainly goes a long way toward establishing and maintaining employee trust and allows our employees the confidence to know they won’t have to follow up or scrutinize record keeping to make sure they are being paid fairly for their work. One of the concerns that caught my eye was when a manager in the hospitality industry, a hotel HR manager, expressed concern that personal employee information such as fingerprints would be discoverable on remote devices. A knowledgeable vendor in the room confirmed what several others mentioned; biometric data is kept in an unrecognizable algorithm, so there aren’t actually any pictures of employee fingerprints, iris, or facial data that can be copied and used. The information is locked in the system and stored in a code that only the system can recognize. If the data were to somehow find its way outside of the system, it would be completely unrecognizable, and inherently unusable. Our employees will be relieved to know that we will have added an additional step to secure their personal data while opening up more ways for them to feel assured that their personal time and attendance records are more accurate, personal, and verifiable. Final caveat: since new state and local labor laws are popping up all the time, all small business owners like myself should definitely review the regulations that affect their specific location before purchasing any type of employee biometric clock system. I have recently learned, for instance, that some states do not allow the capture and use of fingerprints. Check with your local government to make sure the biometric technology you choose is approved for use in your area.